Our house on the mountain. This painting has always been pretty mysterious to me. Two fairies, male and female, or is it Pan and… who? 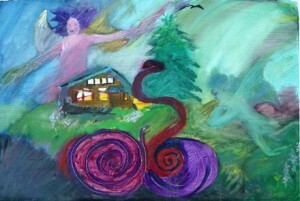 And the twinned snakes of kundalini. It feels like one is me and one Tom, but which is who? The color pallet is stranger even than usual. Stormy perhaps, yet I seem to remember thinking of sunshine and flowers in the meadow garden as I painted. Are the fairies protecting the house? That’s what I thought at the time because as I painted I was remembering our devastating house fire of 1978, when we had just finished building and were moving in. Afterwards we had to decide if the fire was a warning or a test – should we stay and work in this community or not? We decided to stay. Thus the fairies could also be calling me/us to deeper action. Journal 7/30/96: On Sunday Dana (Zia) also spoke of seeing two fairies who had come home from Europe with me. She said they had been attracted by my sparkles (those of my image of myself inside my seed). I had often touched base with that image on the journey as a grounding tool. I must have done it someplace where they saw me and came “on board.” She said one is blue – or perhaps periwinkle, and one pink. A boy and a girl. Wish I could see them. They helped her work on my still badly sprained ankle. They have some purpose for me that they want to help me with. My eyes somehow. The nodules? My vision? Actual vision or…? I can think of several places particularly in England – that land where fairies seem so possible! I have had two dreams about dollhouses that might be my psyche trying to cope with my friends. The first was strangely vivid of my having left a dollhouse with a scene all set up. It was not the dollhouse of my childhood nor those dolls. The dolls and furniture were in incredible detail – like real, but miniature, and I could reach my hand in and rearrange things and talk to them. Nice familiar feeling from my childhood of communing with my doll friends. Rumer Godden understood! None of the details of the dream were clear though. Except dark hair somehow. The one last night is even less clear. But I woke to pee and realized I had been with dolls again. Wondered if it could really be fairies. Fairies have been on my mind since our return though even before Dana mentioned them. What I always call the fairy garden out the east window has been very much in my consciousness – and the foxgloves which are to me fairy havens, are everywhere. Somewhat past their prime I fear – knew I would miss their full glory – but delightful nevertheless. It has been a good year for them as I predicted. And I’ve been quite drawn into the Hobbit books again. I wanted to get in touch with some of the images that coincided with my work with Dana – the blue door, round with wrought iron hinges is just like that described as Bilbo’s. The pool down the sword wound/scar had made me think of Bilbo’s meeting with Gollum and the finding of the Ring. And other things – the placement of the sword itself had felt like something from those books. Now a lot of the feeling – the Elvish places especially – keep ringing strongly. It will be interesting to see if there is more.